PEI Sketch - Acrylic on Paper. 7x10. I have, at last, found myself in Prince Edward Island. Following a week's visit to Toronto and some much-needed catching up time with friends, colleagues, chosen family, and the galleries and museums I love so much, I boarded the train and headed to Montreal. A quick stop-over in Mo-Town and I was on the overnight to Moncton where I was met at the train station by the inimitable Nancy Kenny who was gracious enough to stop at the Art Supply store before heading across the big Bridge to the Island. We even had a chance to get a photo-op with the World's Biggest Lobster. Me and the Lobster. The perspective in this photo makes him look quite small... and like I have quite the unwelcome thumb. I'm staying just outside of a place called Bonshaw on the West River in P.E.I. with my old friend, Cam MacDuffee and his wife, Karen Graves. Cam and I met doing "Fire" at the Lighthouse Theatre in Port Dover many moons ago. He is a performer of great note, a stellar musician, and an all-around good guy. He's invited me out here to help him work on a show that's been pickling in his brain for a while now, spend a little time on the property, and just generally soak up the goodness that is this island. Karen is off playing with the symphony since I've arrived, so Cam and I have hunkered down in the first week to begin the process of exploring his show, and I must say that this is one of my favourite parts of the creative process - the initial discovery phase. I should note that Cam has been working on this project for many years, as is the way with so many shows. I feel quite honoured to be witness to the first unveiling of many of the ideas and concepts that he's unearthed. It's a rare and wonderful time. His passion, creativity and work-ethic are inspiring. What a treat to be a part of this process. Cam and Karen have been playing a Bluegrass/Gospel brunch at the Trailside Inn in Mount Stewart, and with Karen out of town, Cam asked if I would sit in with him and a couple of other musicians: Sarah Wendt and Perry Williams. I was delighted, and we spent our evenings learning tunes and singing our hearts out in preparation for the big day. Sunday morning found us pickin' and grinnin' for a room full of folks celebrating Mother's Day. We called our group, "Call Your Mother", which was a great way to end every song, and gentle reminder for yours-truly to do just that. Singing and playing sure is good for the soul, and I must add - the food was amazing. If you're ever in P.E.I., the Trailside Inn in Mount Stewart must be on the lsit. Sunday afternoon found me at a May Day celebration at the home of Sarah Wendt's brother and Sister-in-law. I was lucky enough to be invited along for the festivities, and it was something to behold. The finished product was stunning. We've started the week off right... Cam has been busy working on his script and I've taken some time to do some writing and get some painting and sketching done. 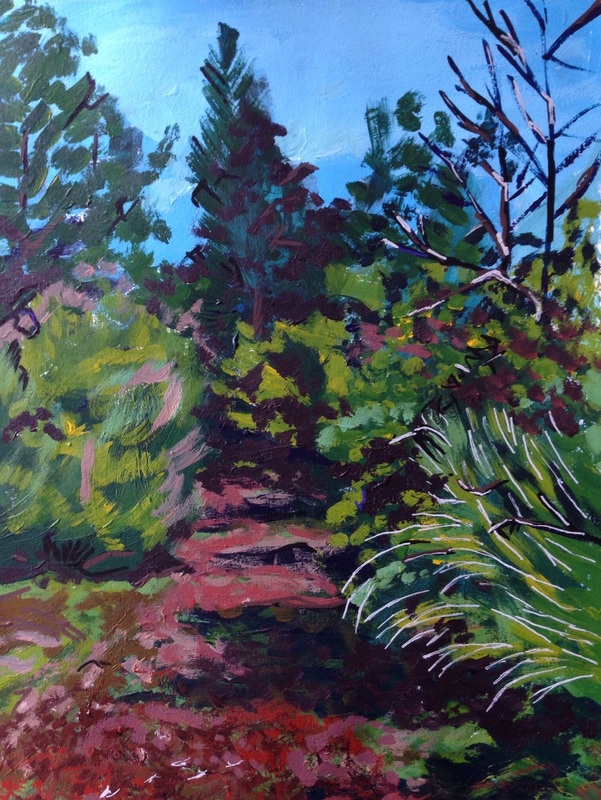 There are woods just behind the house and they are the ideal spot to set up the easel and get lost in the paint.